We’re going to talk about pizza in the form of a warm, cheesy dip today. We’re going to ignore any and all dietary restrictions and get down to brass tax. Cheese plus tomato sauce plus pepperoni plus more cheese plus bread for dipping equal appetizer bliss. If there’s one thing you’ve caught onto by now, it’s that I love making dips. Think…guacamole, white beandip, taco layer dip…it’s something I love. Let’s embrace it! Dips are a quintessential party food and are designed by nature to feed the masses. 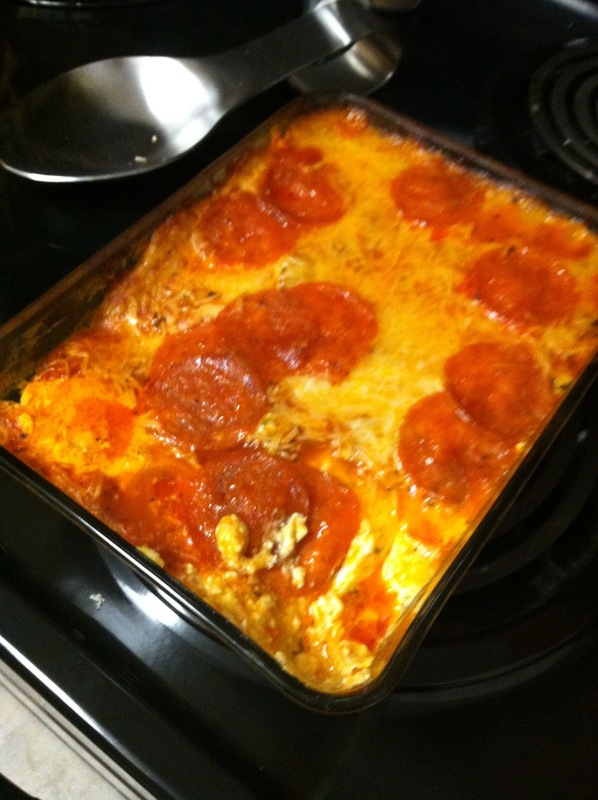 This particular Pepperoni Pizza Dip is much more cost friendly than buying 4 pizza pies for a bunch of friends. Put this dip out and let people take little bites here and there, and your next gathering will be a hit! 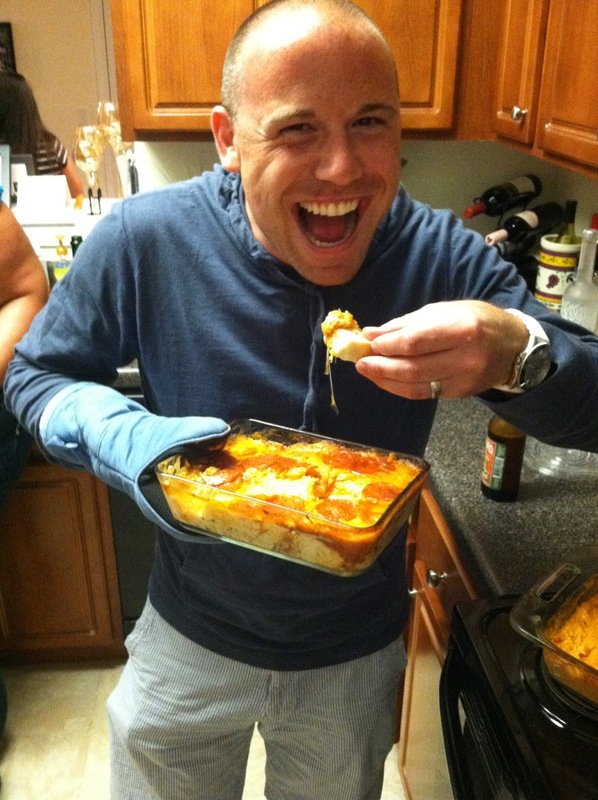 Here's my friend Rich getting ready to dig in to some pepperoni pizza dip I brought to his apartment this weekend. Yum! We ate SO MUCH FOOD and had SO MUCH FUN! Oh, by the way. Like most of my dips, this isn’t difficult at all to put together. It starts where all great things in this world start. CREEEEAM CHEEEESE! (imagine me shouting/singing "cream cheese"
and that’s what I intended that to be). Softened cream cheese gets mixed together with fresh basil, pepperoni slices, olive oil, sour cream, mozzarella, and a little bit of crack black pepper for a kick. This mixture gets spread into the bottom of a casserole or baking dish. Then it’s time for your favorite marinara sauce. Look, go ahead and use the jarred stuff. There are some good ones out there. You can always start with a jarred sauce and jazz it up with lemon juice, fresh herbs, whatever you’d like. This is a judgement free zone. We want this dip to be easy peasy! Atop the marinara goes a a bit more of mozzarella and cheese. It’s like – why not?! Some full pepperonis for flare on top, and so people know what they’re getting into! Bake, wait, and enjoy. I served my pizza dip with chunks of French baguette. Tortilla chips are also a fine dipping vehicle. Go crazy, get wild, put in your favorite pizza toppings, be yourself—always! In a large bowl, mix together the cream cheese, sour cream, 1/2 cup mozzarella, basil, cut pepperonis, olive oil, and cracked black pepper until well combined. Spread the cream cheese mixture into the bottom of a small or medium-sized casserole or baking dish. Spread the marinara sauce on top of the cream cheese. Sprinkle remaining mozzarella cheese on top and arrange a few full pepperonis on top of that. Preheat oven to 350 degrees. Bake the dip until the cheese on top is melted and the sauce and cream cheese is slightly bubbly about 10 to 15 minutes. Serve immediately with bread or pita chips.